Recent uTorrent developments have caused some concern in part of the Bittorrent client's userbase. An increase in advertisement, in form of toolbar and other third party offers during installation and updates of the client software, in-content advertisements, and uTorrent Plus, have put a dent in the program's public perception. Fed up with the development, some users decided to switch clients. But what about partial downloads in the old Bittorrent client? You can either keep on using the old program until all downloads have completed, or find a way to import the partial torrent downloads into the new Bittorrent application to avoid having to download the data from the very beginning. The problem here is that the approach differs from software to software, and that one way may work in one application, but not in another. Generally speaking it should not be difficult, considering that the data that the torrent clients download is the same. Some clients on the other hand may add file extensions of their own to the files they download until the download completes. If that is the case, you may need to remove those extensions from the files so that the new Bittorrent client can recognize the partially downloaded files correctly. Make sure you have both the torrents and their data folders / files available. If the file extension has been changed by the previous application, remove it so that the original file extension is again used. Drag and drop each torrent file into the new Bittorrent application window and select the correct data download folder as the download folder. The program will check the integrity of the files so that downloads pick up right were they stopped in the old program. To add all torrents at once, move the data files to the select download directory first before you drag and drop the torrents into the program interface. 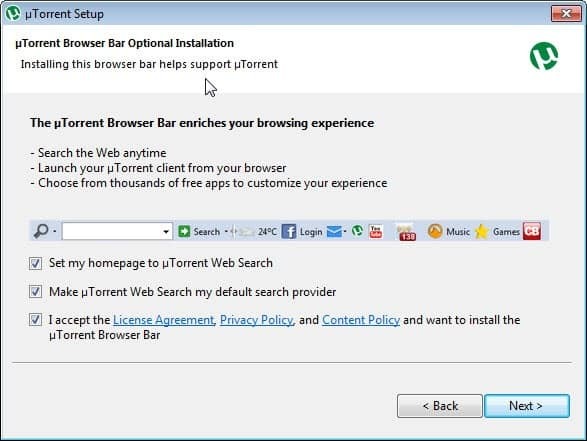 Some programs, like qBittorrent, have options to import torrents from other Bittorrent applications. To import partially downloaded torrents from applications like uTorrent, select File > Import Existing Torrent in the application window. Note that you can only import one torrent at a time using the import option. That's ok if you only need to add a couple torrents, but not really an option if you have dozens or even hundreds of options, especially since you cannot set a default content location in the dialog that is used for all consecutive imports. Sometimes I use this trick to boost my ratio in private trackers. I’ll look up the info hash on Google, download the torrent from a public tracker and use it, then download the torrent file from the private tracker, open the torrent, and set the save location to where the data’s already downloaded. Instant 1.0 ratio that can only increase!